My flight from Toronto arrived in Reykjavik at 6:30 am. Despite the two gravol I took (one is normally enough) , I didn’t sleep very well on the flight. I was happy to be disembarking. It was cool, rainy and very foggy – not necessarily an ideal day for what I had planned, but there wasn’t much I could do about it! 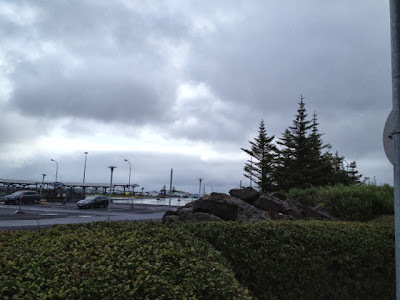 I walked around Keflavik Airport looking for the Reykjavik Excursions desk where I was supposed to pick up my boarding pass. I couldn’t find it, so I asked at information. It’s outside of the security area, but I didn’t want to go there until I was sure I wasn’t going to have to try and get back through security! I also confirmed that my bags didn’t need to be picked up, and that they would go directly to Amsterdam with me. I had some breakfast at Keflavik; there were plenty of options at several different cafés inside the security zone. There were others outside, but were smaller and seemed to have fewer options. There were a few people on the bus with me to the Blue Lagoon, we were all quite quiet, given the early hour of our departure. Thankfully by the time the bus left, the fog had mostly cleared, so I could see some of the landscsape en-route. Iceland reminded me of a kind of European Hawaii – the landscape was similar to Hawaii (with moss and firs rather than sand and palm trees), but the development had a distinctly European look to it. The Blue Lagoon was incredibly fascinating. The water was an ice blue colour, but quite hot in some places! And funniest of all (in my opinion) they have free Wifi! After spending some time in the water, and giving myself a nice silica mask, I wandered inside to see if there was a spot I could sit (and possibly lie) down. I was lucky enough to find the indoor relaxing area which had reclining chairs! I layed down and had a little snooze. When I woke up, the room was packed, I’m very glad I found it when I did! Of course where there’s naturally occurring hot water, there is also a power plant, which you can see in the back-ground of the pictures below. As the day went on, the water got fuller and fuller. There were a lot of english, french and german speaking people. I also overheard two Dutch gentlemen talking about where the sauna was. I was so excited that I understood them that I nearly tried to join in their conversation! At lunch time, I got myself dried off and dressed and headed to the Lava Restaurant on-site. The hostess there kept assuming I was with the German family behind me, which is weird, since I a) was dressed while they were all in their bathrobes, b) I did not fit in age-wise – I was twice as old as the kids, and clearly younger than the parents. Maybe she thought I was a crazy aunt or something and c) they were talking German while I kept responding to her in English. The buffet lunch was included in my package, and it was pretty good. It also included unlimited fresh water, which was amazing – I was expecting it to be extra, as it usually is in Europe. After lunch I took another slow walk around the grounds, before heading back to the change rooms to finish drying my hair and get my stuff to go. The bus going back to the airport was packed – to the point they had to bring in an extra bus to get everyone back. I already had my baggage checked and boarding pass, so I wasn’t worried about being late. And I had no reason to be. Getting through security was relatively quick, which gave me time to do some looking around at the airport. Despite having a USB port on the entertainment system on the plan from Toronto to Reykjavik, my phone didn’t charge. Since I had packed my plug (and it was a type A anyways), I bought a type C USB charger at the airport. I asked the guy at the Helko where I might be able to charge it, and he said “right here, just come back when you’re ready to leave.” So I did, and thanks to him, I had a fully charged phone for the rest of my trip! While my phone was charging, I got a coffee and cake at the Kaffitar cafe. The gluten free chocolate cake was incredible, and I would recommend it to anyone and everyone. I am looking forward to another slice on my way back through!! I also looked around for a new coat. It was 27C and sunny when I left my house, and since I didn’t already have it packed, my trenchcoat got left in my closet in Toronto. There were some lovely Burberry jackets at one of the stores, but the did not have prices. I have a rule aboug items without prices – if you have to ask, it’s too expensive! So I am still jacket-less, but the weather forcast is promising for the next little while. I am very disappointed that the only Icelandic word I learned was ut, meaning out or exit (there were lots of signs!). I feel terrible that I couldn’t even say hello and thank you. I feel like if you’re travelling somewhere with another language (i.e. almost anywhere) you should be able to say these two things. I have some work to do before I’m back there in November.